In some cases sensitivity of an assay can be improved by incorporating antibodies with a high affinity for the target antigen; for example, when measuring an antigen known to be at a low concentration in the sample or when using anti-peptide antibodies for immunoaffinity capture and enrichment. The affinity of recombinant monoclonal antibodies generated using HuCAL technology is comparable to monoclonal antibodies made using conventional animal methods. For protein antigens it is generally in the range 1-100 nM, and in many cases sub-nanomolar affinities are achieved. In contrast to animal-derived antibodies from serum or hybridoma supernatant, HuCAL antibodies can be easily optimized for affinity, since the antibody DNA sequence is known and available. The specificity of the antibody usually remains unchanged during the antibody maturation, while the affinity can be routinely improved by a factor of 102 to 103. The final result depends on the affinity of the parental binder and the nature of the antigen. Affinity maturation is an optional step that can be performed once antigen-specific HuCAL antibodies have been selected. Binding characteristics are optimized by inserting pre-built CDR library cassettes (usually at LCDR3 or HCDR2), which have been diversified according to the natural repertoire of CDR sequences at unique flanking restriction sites, Figure 1. Fig. 1. 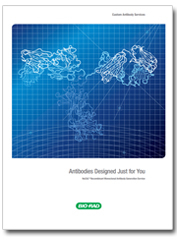 Optimization of binding characteristics of a HuCAL antibody occurs via CDR library creation for specific binders in a simple cloning step. This approach starts with an antibody selected from the standard antibody generation process that shows a very high specificity, but lacks sensitivity in the desired application. The LCDR3 or HCDR2 region of the parental antibody sequence is exchanged with highly diversified cassettes to generate a new antibody library of up to 108 antibodies differing only in the sequence of the exchanged CDR. 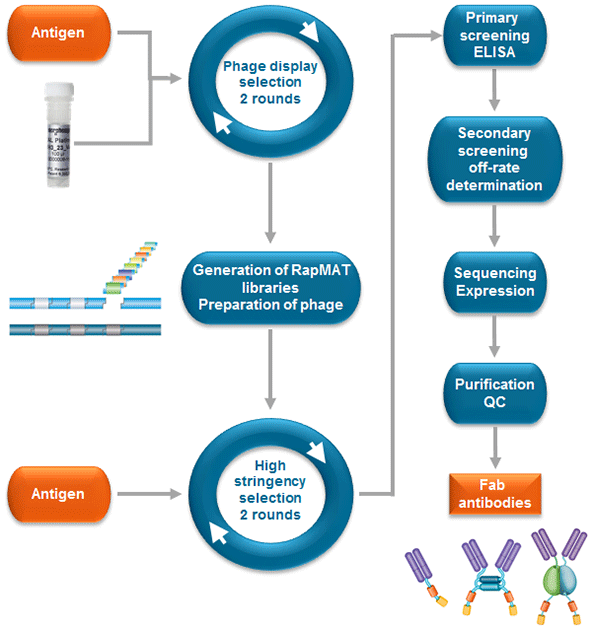 Phage panning on the antigen is repeated with higher stringency; for example, by increasing the number and/or length of the washing steps, or reducing the amount of antigen in the panning rounds. The result is affinity matured unique antibodies. As part of the screening step, a high throughput off-rate determination is recommended for a minimum of 95 antibodies in order to select those with the highest affinities. These antibodies are then purified and the affinity is measured. Improvements of 102 to 103 can be expected. The result depends on the affinity of the parental binder and the nature of the antigen. A single binder affinity maturation project is likely to take 6-7 months. This includes the initial 8 weeks for Fab antibody generation, time to test antibodies and select the parental clone for maturation, a further 16 weeks for the generation of the new antibody libraries, panning on the antigen, koff-rate ranking, purification and final affinity determination. Fig. 2. 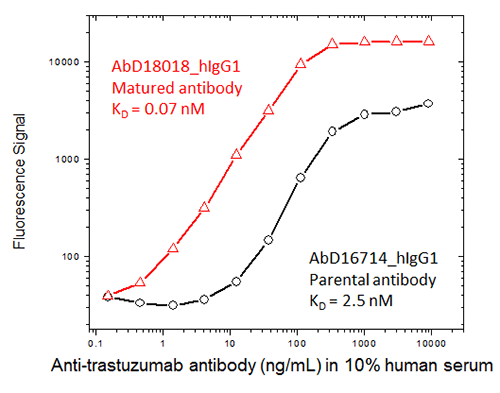 An anti-trastuzumab antibody ranked as having the highest affinity after maturation (red) was compared with the non-matured, parental antibody (black) in an ADA bridging ELISA format assay; the data highlights the difference in sensitivity obtained with the affinity matured antibody. A more time efficient approach for affinity maturation is rapid pool maturation, RapMAT®. This method is recommended when it is known at the outset that a maturation step is likely to be required to meet very high affinity requirements for the antibodies. Affinity maturation is incorporated as part of the standard HuCAL antibody generation process. Starting with the complete HuCAL antibody library of 45 billion Fab antibodies, two rounds of panning on the antigen are carried out. Following this, the pre-enriched pool of phage displaying antibodies specific to the target antigen is taken and for each antibody sequence the LCDR3 or HCDR2 is replaced in a pool cloning step to create a new library. Subsequently this library is used for two further rounds of panning applying a higher stringency. This RapMAT process takes approximately 16 weeks, Figure 3. Fig. 3. Process flow for RapMAT rapid pool affinity maturation. Our technical experts are looking forward to designing a strategy to generate the antibodies required for your assays and will be able to recommend an affinity maturation approach appropriate to your project needs.